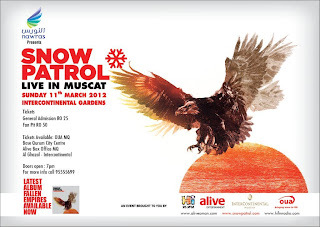 Well today's the day, Snow Patrol will be playing live at the InterCon gardens tonight. The gates are opening earlier as it's a school night - gates open at 6, and the show starts at 8, so we should be all done by 9pm or thereabouts. There's still a few tickets left and they will be available on the door, or they can be purchased at the Bose store in the ground floor of the Qurum City Centre. Moving on, there is also Russell Peters tickets (albeit not very many left) available for sale at the Bose store in QCC as well. 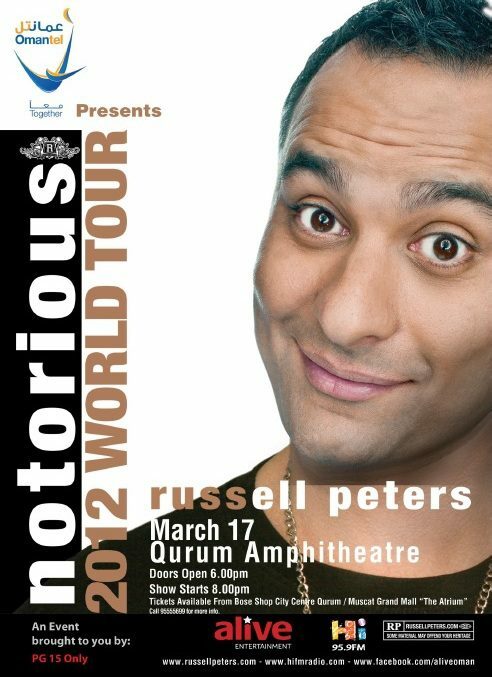 Tickets for this show (to be held next Saturday 17th - St. Patricks Day) went on sale yesterday at 4pm in two different locations (Bose store in QCC and the atrium in the Muscat Grand Mall) and over 3000 tickets were sold to the show yesterday. The show is being held in the Qurum Amphitheater, with the gates opening at 6pm, and the show starting at 8pm. Ticket prices are RO 25, 35, 45 and 55, although I understand the 45 and 55 rial tickets have sold out (I might be wrong). Guys, are there any tickets left? Got in line at 2.30 PM on 11th March at QCC for RP tickets but till 4.30 PM the line had not moved when I had to leave to pick someone at the airport. Not expecting any tickets to be left, I returned to QCC @ 6.30 PM on the off chance that some tickets might be left only to find a bunch of tickets in all classes still being sold with nary a soul in sight. Felt a bit stupid.